Americans are visiting their primary care physicians and hospitals less frequently, but they’re paying more for health care nevertheless. The number of visits to hospitals, emergency rooms and primary-care doctors has declined every year since 2012, according to new data from the Health Care Cost Institute, while the use of outpatient services and specialists has gone up. 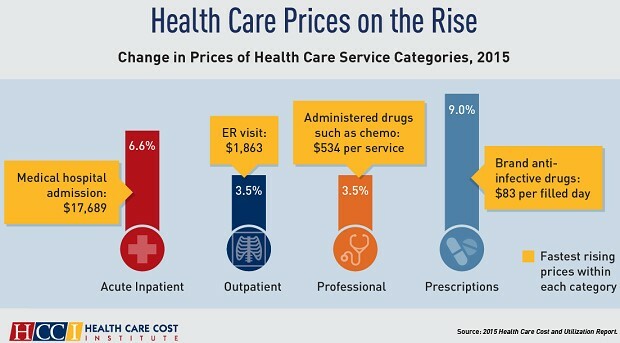 Regardless of how they access medical services, however, Americans are seeing higher prices, as the cost of care increased across every category of care. Brand-name prescription drugs saw the biggest cost increase, spiking 22 percent from 2012 to 2015, while inpatient care grew at the slowest pace, increasing 5 percent over the same period. Price increases were the largest driver of spending growth in the study. Last year alone, the cost of brand-name prescription drugs grew 11.4 percent, to $649 per capita. Spending on generic drugs grew at a slower rate of 3.3 percent per person, to $313. The average price per day for generic prescriptions has remained at $1 for the past four years. Spending for Americans who get insurance through work increased to $5,141 per capita last year, with out-of-pocket spending growing 3 percent to $813. Spending was higher for women and for those over age 45. The report analyzed data from Aetna, Humana, Kaiser Permanente and UnitedHealthcare from 2012 to 2015.